Custom Spurs from Montana Silversmiths. * Your brand cut into solid steel custom spurs. If you prefer, add 1 - 3 silver initials. * Custom Spurs arrive in a beautiful clamshell gift box, ready for presentation. 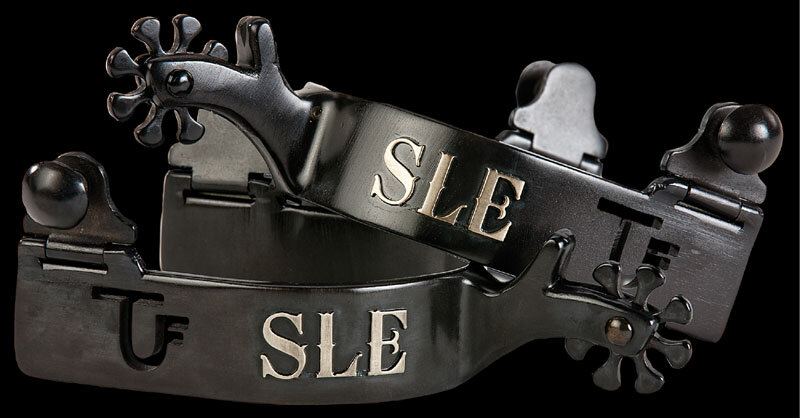 * CUSTOM SPURS WITH BRANDS ONLY - After placing your order, send your brand design to us by email, FAX, or regular mail. Some brand not available. * Custom Spurs usually ship in 4 weeks. * Custom Spurs are made to order by American craftspeople in Columbus, Montana, U.S.A.